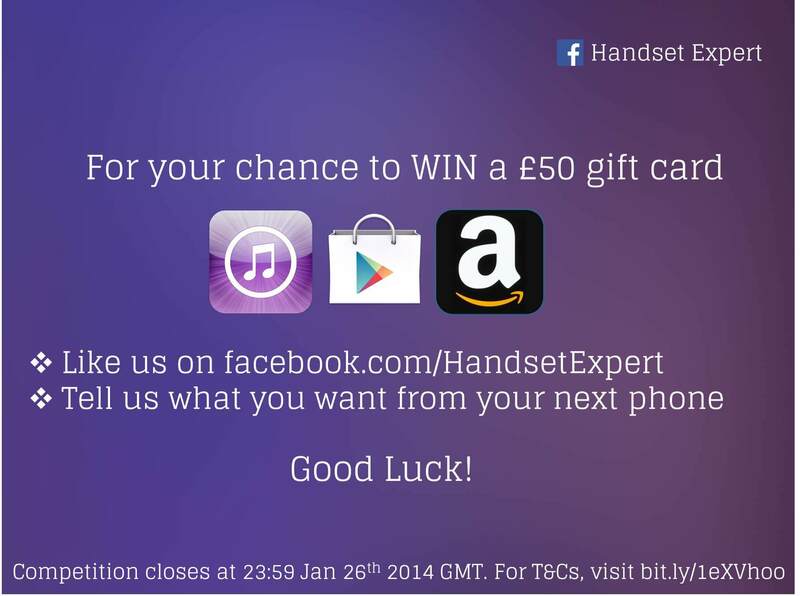 HandsetExpert | Competition Time - Win a £50 gift card! Entries must be received by 23:59 GMT on January 26th 2014. To be eligible, entrants must both (a) like the facebook account facebook.com/HandsetExpert or the relevant competition post, and (b) answer the question in the competition post in facebook by the competition deadline. The prize is a choice of one of the following options (a) One iTunes gift card to the value of £50, (b) One Google Play gift card to the value of £50, (c) One Amazon.co.uk gift card to the value of £50. Reasonable efforts will be made to contact the winner(s) within 48 hours of the competition closing. If the winner(s) cannot be contacted, or are unable to comply with these terms and conditions, the Promoter reserves the right to offer the prize to the next eligible entrant drawn at random.